Korea's shipping agencies are set to establish a shipyard that specializes in repairing ships with high added-value after forming a consortium. 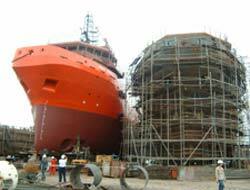 It is the first time that shipping agencies are joining to build a repairing shipyard. According to the industry, Korea"s seven middle-sized shipping agencies formed a consortium to create the tentatively named "Busan New Port Repairing Shipyard Corporation," and recently suggested its business proposal "Construction of Outfitting Quay and Dry Docks at Busan New Port" to the Ministry of Land, Transport and Maritime Affairs. Shipping agencies participating in the consortium include Korea Marine Transport Co., Namsung Shipping Co., Korea Line Co., Pan Continental Shipping, Sunwoo Shipping, KSS Line Shipping and Hyopsung Shipping. The consortium will be jointly led by Hyopsung Shipping and Namsung Shipping Co. The repairing shipyard will be located nearby Busan New Port in western Busan and cover an area of 185,000 square meters (around 56,000 pyeong). After considering validity of the business, the ministry will decide whether to approve the shipyard construction by the end of this year. Other shipping agencies are also scheduled to suggest a business proposal to establish a repairing shipyard to the ministry. In its proposal, the consortium said, "Even though Korea is a shipbuilding powerhouse, its shipping agencies have to send its middle-to-large scale ships in need of repair to other Asian nations including China and Vietnam. Since no Korean shipyard is capable of examining and repairing large ships, Korea has no choice but to waste a large amount of foreign currencies. Also, there is a risk that shipbuilding technologies would be leaked in the repairing process." Shipping agencies explain that no local shipyard can repair higher value-added ships larger than 170 meters in length. Daewoo Shipbuilding & Marine Engineering Co., Hanjin Heavy Industries & Construction Co., and Hyundai Mipo Dockyard Co. had participated in ship repairing businesses in the past, but they recently shifted their focus to highly profitable shipbuilding businesses while reducing or closing their repairing businesses. A source close to the consortium said, ?Busan New Port is a good place to run the ship repairing business since it is crowded with shipbuilding companies. The consortium can secure 70-80 percent of the total sales only by repairing ships of the shipping agencies belonging to the consortium.? The consortium believes its business would contribute to boosting Busan"s economy by generating annual sales of 97 billion won. However, some experts criticize the efforts to build a repairing shipyard. A source from a shipbuilder said, ?Due to high labor costs in Korea, it would have weaker price competitiveness compared to overseas ones. Since a repairing shipyard pushes out more waste than a shipbuilder, it could contaminate the marine environment.? Jo In-gap of Good Morning Shinhan Securities said, ?It"s understandable that shipping agencies need a repairing shipyard. Given the enormous amount of investment need for the project, however, it can be a good solution to forge a strategic alliance with established shipbuilders and let them repair large ships. ?